Following on from the recent interview with 3rd place winner Betsan Evans, today I’m talking to Priyanka Rampal. Her design won the public voting part of the competition which put her in 2nd place (the winning design was picked by me before the voting happened), but I have to say that out of the 20 finalists it was always a strong contender for 1st place. Priyanka had a very historical take on the Modern Classics theme, with a design that was influenced by Georgian fashions. It was a design unlike anything I’ve seen before and definitely one of the highlights of 2015’s competition – I wouldn’t mind a set like this myself! Congratulations on winning 2nd place in my 2015 design competition, the ‘public favourite’ design with the most votes! What motivated you to enter the competition? 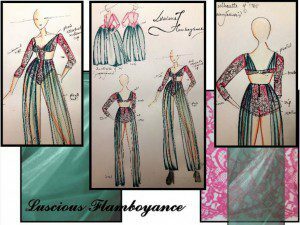 The idea of competing in a ‘lingerie’ design competition was thrilling and the theme of the competition particularly caught my attention. It was novel and challenging, it helped me explore my creative capabilities. Your design was one of the few entries that was inspired by fashion from further back than last century, specifically the Georgian era. How did you come up with your interpretation of the Modern Classics theme? History has always been a source of inspiration and my favourite genre to read. The Georgian era symbolised everything ostentatious from their lace ruffled sleeves to beautifully draped and structured skirt flounces. The flounce inspired the sheer pants and the seam lines and boning of the Georgian corset motivated me to a great extent. 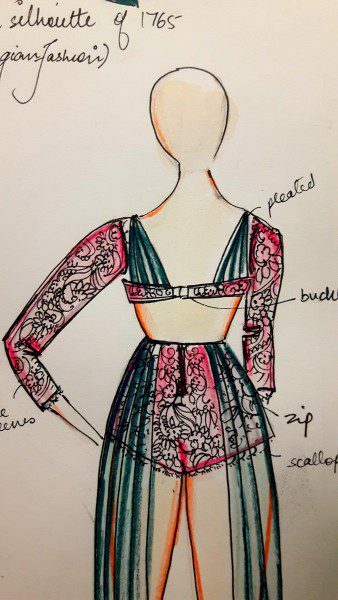 As a DeMontfort student you’re no stranger to lingerie design. What’s your usual design process for creating a new piece? Yes, I am very fortunate to be given an opportunity to study at such a prestigious institute. My design process is drawn a lot from mind mapping, sketching, and continuous observation. The sketching of my inspirations is particularly reflected in my designs. Earlier this year you wrote a thesis on post-operative lingerie for survivors of breast cancer. Can you tell my readers a bit more about that and the conclusion of your research? The thesis was done a while ago and I’m glad much has changed since then. In the thesis I studied mostly the lives of women after mastectomy, the trauma is not just physical but mental as well. No women is ever prepared for the cancer treatment and certainly not for the aftermath. Breasts play the role of defining the female form, the adjustment to that altered form is very difficult. There was not much the industry had to offer to make these strong women feel better. Now, big labels like Marks and Spencer, BHS etc. have beautiful options for them. Do you have a particular sector of the lingerie industry that’s your favourite to design for – like post-operative, full bust, luxury etc. – and why? I would not say I have a favourite, if I open my closet you’ll find everything the sector has to offer. I seem to have a relationship of moth to a flame with them. But a sector of lingerie I would want to focus my time and skills on, would be post-operative lingerie. What are your plans for the future in the lingerie world? Breast cancer is a cause I’m certainly very passionate about. As a designer your job is to solve a problem, make lives better. We enjoy lingerie shopping, it makes us feel beautiful, womanly… imagine your plight of entering into a store and suddenly have just one section or one rack for yourself. The women who have gone through a mastectomy or bilateral mastectomy feel stripped of their femininity, I want to design mastectomy / bilateral mastectomy lingerie with a wide range of beautiful styles, colour, lace and designs. My future plans would be to explore and collaborate with textile innovators to launch a brand with collections that are not just aesthetically pleasing, but help in the healing process as well. Finally, which are your top 3 favourite lingerie designers or brands and why? My top 3 favourite brands, that’s a tough question. I’d place Bordelle on the top of my long list of favourites, their designs are bold, black and beautiful. Could you ask for more?! Marks and spencer absolutely wins when in consideration of fitting – impeccable like a glove. Agent Provocateur is just breathtaking with the seams, the cut, corsets, aesthetics and oh the luxurious lace! I can go on and on but you asked for three, so I’ll stop. Thank you to Priyanka, and don’t forget to check back for my interview with the 2015 grand winner, whose design is currently being sewn up ready to go on sale! 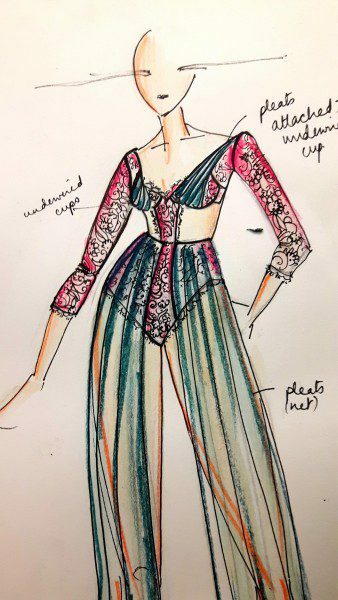 What do you think of Priyanka’s flamboyant, Georgian-inspired lingerie design, would you wear it?